Touch �eco� on the �apps� screen. 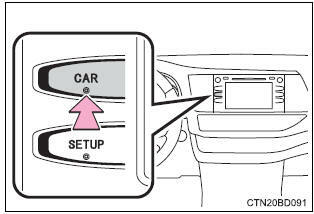 If the �past record� screen is displayed, select �trip information�. Average vehicle speed since the engine was started. Elapsed time since the engine was started. Vehicles without a smart key system: average fuel consumption for the past 15 minutes is divided by color into past averages and averages attained since the engine switch was last turned to the �on� position. Use the displayed average fuel consumption as a reference. Vehicles with a smart key system: average fuel consumption for the past 15 minutes is divided by color into past averages and averages attained since the engine switch was last turned to ignition on mode. 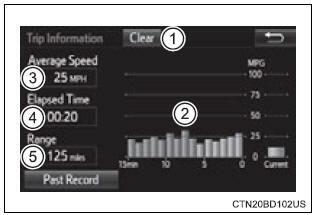 Use the displayed average fuel consumption as a reference. This image is an example only.